The Import Project dialog allows you to import a sequence which you exported for conformation, edited in a third party video editing software and re-exported for import in Storyboard Pro. You can import a sequence in Final Cut Pro XML Interchange Format (.xml), or in Advanced Autoring Format (.aaf). Refer to your video editing software’s documentation to learn how to export the animatic project in XML or AAF format. It is recommended to only import a sequence which was originally exported from the same project via Storyboard Pro. If you import a video editing sequence that was not originally exported from your project, the panels in your sequence will be imported as bitmap images. In your original storyboard project, select File > Conformation > Import Animatic Project. Sequence You can click on the Browse button next to the Sequence field to browse for and select the AAF or XML sequence which you exported from your video editing software. Changes to audio tracks, new audio tracks, deleted audio tracks, as well as changes to sound clips, their in and out points, their volume envelope, deleted sound clips and new sound clips in the imported sequence will be conformed into your Storyboard Pro project. Uncheck this option if you do not wish to make any changes to your project's audio tracks and sound clips. Changes to panels such as their cue time, their length, their order, deleted panels, new panels, transitions, camera movements and, in the case of XML sequences, layers and layer animations in the imported sequence will be conformed into your Storyboard Pro project. Uncheck this option if you do not wish to make any changes to your project's storyboard and animatic, but only to the audio tracks or captions. TIP You can import audio tracks composed from scratch in a video editing software by exporting them into an XML or AAF sequence, then importing the sequence via this dialog, with the Process Video option unchecked. 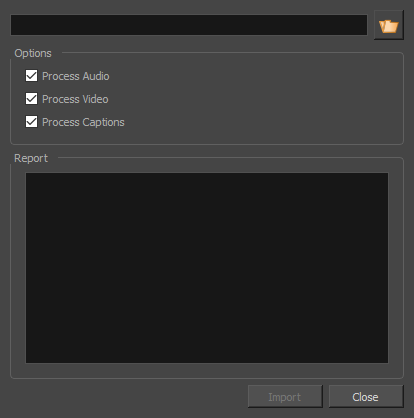 Changes to the panel captions in the imported sequence will be conformed into your Storyboard Pro project. NOTE If you exported your captions without Rich Text Formatting, and made changes to them, they will lose their formatting when the changed captions are imported into your project. When you click on the Import button, this will display information about each step of the conformation process, as well as any error it encounters in the process, if any. Import Once you have selected the XML or AAF sequence and the options you want, click on the Import button to import the sequence and apply to changes that were made to it to your Storyboard Pro project. Close Dismiss this dialog box.